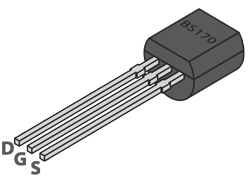 The BS170 is a handy N-channel MOSFET capable of continuously driving up to 500mA. This type of MOSFET is often referred to as a logicl level FET since it has a very low gate threshold voltage of around 2.1V. This makes it great for use with digital circuits and signals from devices such as Arduino and even Raspberry Pi. The BS170 works well as a gate driver for larger MOSFETs that require a higher gate threshold voltage but that you want to control with a smaller voltage such as 5V or 3.3V. I'm still learning. Inexpensive transistors are perfect for this. And yo can't beat the price!